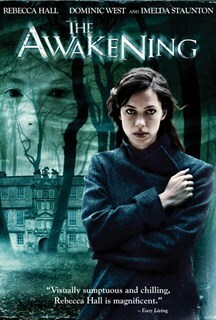 The Awakening is a supernatural thriller starring Rebecca Hall (The Town, Iron Man 3) and Dominic West (HBO's The Wire). Set in London in 1921, Florence Cathcart (Hall), author of the popular book “Seeing Through Ghosts,” has devoted her career to exposing claims of the supernatural as nothing but hoaxes. Haunted by the recent death of her fiancé, she is approached by Robert Mallory (West) to investigate the recent death of a student at the all-boys boarding school where he teaches. When students at the school report sightings of the young boy’s ghost, she decides to take on the case. Initially, the mystery surrounding the ghost appears nothing more than a schoolboy prank, but as Florence continues to investigate events at the school, she begins to believe that her reliance on science may not be enough to explain the strange phenomenon going on around her.